The longtime chairman of the Roger Williams University board admitted Monday that he had used the N-word during a board meeting, saying it "kind of slipped out." "I apologized for that," Ralph Papitto said in an interview on WPRO-AM. "What else can I do? Kill myself?" Papitto, 80, who stepped down this month after nearly 40 years on the board, admitted he used the racial slur at a May meeting of the school's board of trustees. He had been discussing the difficulty of finding blacks and other minority members to serve on the 16-member board, which at the time included 14 white men and two women. Barbara Roberts, then a board member, said Papitto became irate when he discussed pressures to make the board more diverse, at one point using the slur to refer to black candidates. She said he then told the board he knew he couldn't say that because of Don Imus, the radio host who was fired after referring to Rutgers University women's basketball team members as "nappy-headed hos." "There was, like, this complete and utter silence, and I was shocked beyond belief and very angry," Roberts said. 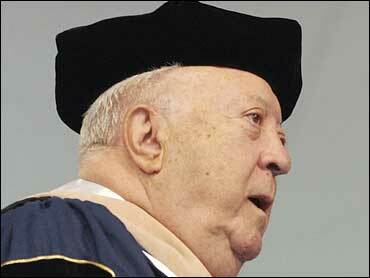 Papitto has given the school at least $7 million, and his name is on the law school, the only one in Rhode Island. He said he had never used the term before. "The first time I heard it was on television and then rap music or something," Papitto told WPRO. The school's president, Roy Nirschel, and the law school dean, David Logan, denounced Papitto's remarks in separate statements Monday. "Such behavior has no place in the Roger Williams educational community," Logan said. Nirschel echoed the sentiment, condemning Papitto for "using inappropriate language or derogatory language toward any individual or group." Leaders of three student groups at the law school said they want Papitto's name removed from the Ralph R. Papitto School of Law. "Several people e-mailed me that it will be a disgrace to have the Papitto name on their resumes and their diplomas," said student leader Matt Jerzyk in an e-mailed statement. Roberts also has called for Papitto's name to be removed from the law school. Logan plans to present the board with a petition from law students demanding that the school's name be changed, said university spokeswoman Judi Johnson. Papitto said his decision to step down from the board was based on his age and his desire to spend more time with his family. He denied a newspaper report that he was forced out over the racial epithet. Three board members, including Roberts, said they were ousted after calling for Papitto's resignation after the incident. A man who answered the phone at Papitto's home hung up on an Associated Press reporter Monday. Roger Williams University, in Bristol, has about 3,800 undergraduate students. The law school opened in 1993 and was renamed in 1996 for Papitto, the founder of the Fortune 500 company Nortek Inc.